Conditional Logic lets you configure a form to show or hide items depending on a user's selections. You can easily show or hide fields, change a field name, or send a specific response based on a user's response. Any form component can use conditional logic to determine when to hide or display itself. The settings for a conditional field, are configured on the component itself, and can be found by viewing the Conditional tab within the components settings. Each field can hide or display. The visibility is dependent on another component defined within the form. The logic is activated when the configured field contains the plaintext value defined in the settings. show = data["external-field-id"] == "value"
Conditional logic for relationship fields can be done both on the podio id or title of the related item. 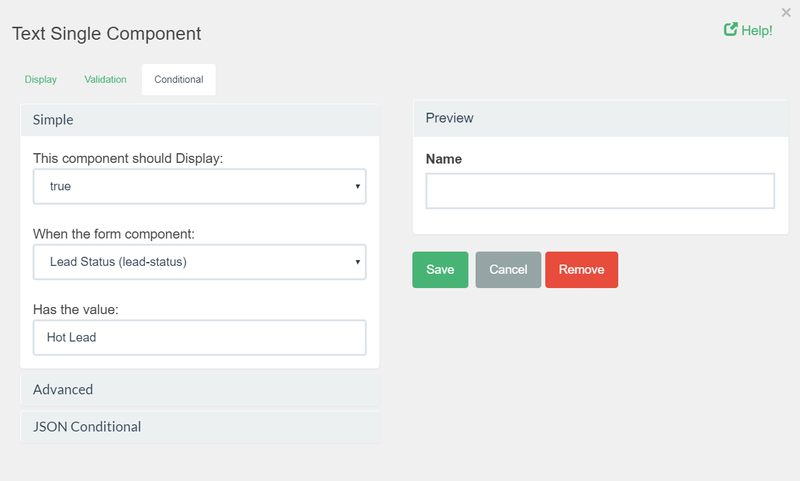 The form component will be shown it if at least on selected item matches the condition in the for statement. show = data["text-field"] == "hello"
The condition above will show the form component if the field with external ID "text-field" has input value "hello". The condition above will show the form component if the 1st OR 2nd option of the category field with external ID "category-field-2" -field-1" is selected. The condition above will show the form component if the field with external ID "text-field-1" has input value "yes" AND if the 2nd option for field with external ID "category-field-1" is selected. The condition above will show the form component if the field with external ID "single-category" has an input value different from the 1st label.